Monitor Your Treatment Of Gout is the stage in your gout treatment plan where the action starts. Up to this point, we have been planning the best gout treatments to suit you. Now we start controlling gout pain, and/or lowering uric acid, according to your plan. Monitor Your Treatment Of Gout. Do not start this step until all preceding steps have been completed. If you have already started taking gout medications, we can create a retrospective plan. The sooner you do this, the better your chances of success. If in doubt, review all the steps from Starting Gout Treatment Guidelines. before you continue. Exact doses of each gout medication will be in your Personal Gout Treatment Plan. Hopefully, this is agreed with your health adviser. If not, I can help you create your treatment plan in my gout forum. Until you have completed a uric acid control plan, you must train yourself to be aware of your gout symptoms. This allows you to spot the first signs of a gout attack. Then you can take your gout pain medication before it is too late. I recommend keeping a journal of gout symptoms. Your health adviser might provide a chart for you to record your daily gout symptoms. There are several different types available. Or, you can develop something more meaningful to you. It has to be easy for you to use. 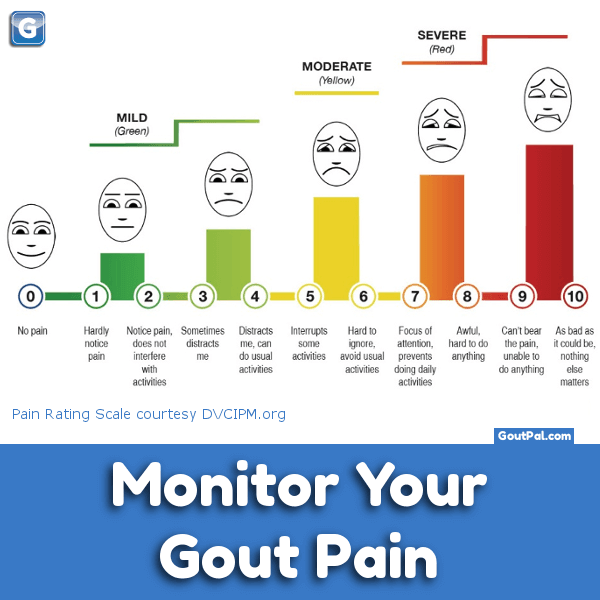 If you like, you can record your pain scores in my gout forum. This can encourage you during your darker days. Assess gout symptoms daily. You must monitor your gout treatment. You should also keep a journal of uric acid test results. You need to record the date, and your uric acid level. If you are recording this in your GoutPal Personal Gout Profile, you should include the measurement scale used for your uric acid test results. In the USA, mg/dL is still the most common. In other countries, your scale might be mmol/L or ?mol/L. At the start of your gout treatment plan, you set your goals. Once you have achieved what you wanted, you can stop monitoring. You might also be able to reduce or stop your gout treatment. That happens as you move towards completing your treatment plan. We look at that in the final 2 steps. Monitoring your treatment of gout varies according to your plan. Your health adviser can guide you with that. Or, you can get personal help in the gout forum. Leave Monitor Your Treatment Of Gout to browse the Gout Treatment Guidelines.